Military decorations are awards made to soldiers, sailors, and airmen for heroism or for outstanding performance of their duties. They are an ancient custom that was perpetuated by medieval orders of chivalry and became institutionalized in modern armies. By the time of the Pacific War, a decoration typically took the form of a medal (a pendant draped from a ribbon) worn with the dress uniform, but could it take other forms. When in service or combat dress, a small ribbon was usually worn in place of the medal, usually over the left breast pocket. Decorations had a formalized order of precedence, reflecting the criteria for each decoration. At the top of the hierarchy were awards reserved for great acts of heroism beyond the call of duty, such as the American Medal of Honor or the Commonwealth Victoria Cross. Lesser decorations were awarded for exceptional military skills such as marksmanship, for length of service, or for participation in a particular military campaign. In some cases, a decoration came in several classes for various levels of merit, such as the seven classes of the Japanese Order of the Golden Kite. Decorations were considered important for building morale, and each military service had to strike a balance between awarding enough decorations to create a sense of pride while not awarding so many decorations that their value was diluted. Lesser decorations could be awarded by commanding officers according to straightforward criteria, but the higher awards typically required nomination by a high-ranking officer and the concurrence of a review board. Sledge (1981) voiced a common complaint that enlisted men often did not receive a well-deserved decoration simply because no officer of sufficient rank witnessed the act of heroism. 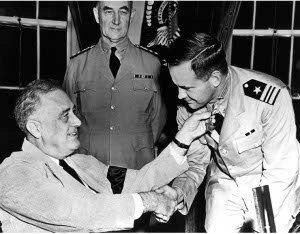 The highest American military decoration was the Medal of Honor, awarded for "gallantry and intrepidity at the risk of his life above and beyond the call of duty." Over half of the awards were posthumous. Lesser acts of heroism could result in an award of the Navy Cross (Navy and Marines) or the Distinguished Service Cross (Army). The Silver Star was awarded for "gallantry and intrepidity in action, not sufficient to justify the award of the Medal of Honor or Navy [or Distinguished Service] Cross". The Distinguished Service Medal was awarded for outstanding performance, not necessarily in combat. It was often awarded to flag and general officers who directed important operations. The Bronze Star could be awarded for any meritorious service in combat. It could be spot awarded by senior officers to enlisted men, and Perret (1991) claims it was awarded so frequently that its value was significantly diluted. The Purple Heart was awarded to soldiers, sailors, or airmen who were killed or wounded as a result of enemy action. The wound had to be serious enough to require medical treatment, but in practice this was not a tight restriction. During the torpedoing of Saratoga, Frank Fletcher "banged his head against something" (Lundstrom 2006) and suffered a bloody cut that forced him to call a pharmacist's mate to bandage his forehead. He was duly entered into the casualty list and, to his considerable embarrassment, he was later awarded the Purple Heart. 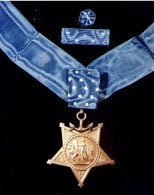 There were numerous lesser awards for meritorious or gallant service, as well as a bewildering variety of campaign, service, and skills decorations. An exhaustive list of these lesser awards is beyond the scope of this Encyclopedia. The highest Commonwealth decoration was the Victoria Cross, which, like the Medal of Honor, was awarded only for outstanding heroism and very often posthumously. Lesser awards included the Distinguished Service Order and the Military Medal. A soldier might also be Mentioned in Despatches, meaning that he was commended for gallantry in a formal report by a senior commander published in the London Gazette, the Crown's official journal of record. As with the Americans, the Commonwealth nations awarded a bewildering variety of lesser awards for meritorious or gallant service and a variety of campaign, service, and skills decorations. Though it was not a military decoration in the strict sense, a senior officer might be knighted for outstanding service. Few of the senior officers of the Commonwealth nations escaped this honor. The chief Japanese military decoration was the Order of the Golden Kite, which had seven classes. Enlisted men could be awarded only the sixth and seventh classes. Army commanders could spot award the fifth, sixth, or seventh classes, although this had to be subsequently ratified by the War Ministry. A total of about 630,000 awards of this decoration were made during the Pacific War. The Japanese also awarded a Military Wound Badge that corresponded to the American Purple Heart, and the usual variety of campaign, service, and skills medals. A peculiarity of the Japanese regulations for decorations was that decorations were to be returned to the War Ministry upon the death of the recipient.